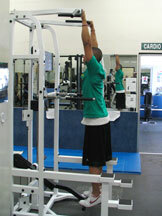 Increases the coordination of the scapular complex and integrates pulling strength. Read the instruction placard before using this or any machine. Ensure a neutral spine by contracting deep abdominal muscles, keeping the chin level, and the gluteal muscles tight. Select the appropriate weight. Remember, the more weight the easier the exercise. Use the desired hand grip position. Be very careful when using a wide grip. Step to the weight assist-bar from the top step. Use the desired hand grip position. Be careful when using a wide grip. 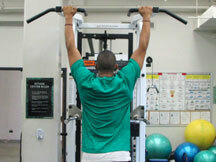 Maintain a neutral spine position throughout the exercise. Lower your body in a controlled manner, until the elbows are almost straight. Never allow your body to drop in a uncontrolled manner or your elbows to lock at the bottom of movement. 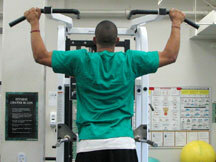 Maintain tension in the back musculature throughout the exercise. Pause for a count of one at the bottom of the movement before pulling upward. Do not hang. 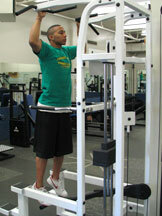 Pull upward without arching the back. 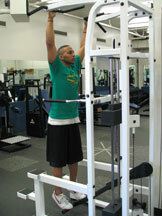 Pause at the top of the movement for a count before lowering your body. Do not step off of the weight assist bar until it has cleared the top step. With one foot on the top step and the other controlling the weight assist bar, slowly return the weight to a resting position. Lower your body in a controlled manner, until the elbows are almost straight. Pull upward without arching the back. 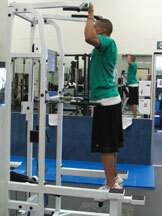 Pause at the top of the movement for a count before lowering your body.